Kevin and Peter decided to take a break from collaborating on the TMNT book and do some issues separately. This issue is Peter's solo flight. The story begins with Mike shooting an apple off of Don's head with a bow and arrow, ala William Tell. This is Mikey's way to prepare a fruit salad - but Don has grown tired of the exercise and the pair join their brothers, Splinter, Casey and April, who are having a picnic out in the woods. As Mike and Don sit down to feast, a man comes crashing through the bushes and lands face first in their bountiful blanket. The intruder's glasses are lost and he frantically asks where they are. Unfortunately in the next breath, one of the Turtles steps on the glasses. Casey is enraged by the man and grabs him by the collar, threatening to pound him. April gets Casey to cool his jets and put the fellow down, and he explains his predicament. His name is Michael Murphy, he's a physics student who was kidnapped by a group of survivalists five weeks ago. The group, who call themselves the "Committee to Rebuild American Patriotism" (nice acronym, eh? =O) , wanted the student to build them a nuclear bomb that they could use to start a war with Russia. Don asks Michael if he built the bomb and the student replies that he had to, or C.R.A.P. would have killed him. 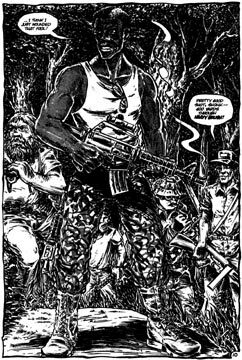 Murphy pleads with our heroes to help him when he is shot in the chest by a sniper. The wound isn't fatal but it is bleeding badly. 600 yards away we see the survivalists. Their leader, Skonk, is unhappy that he only wounded Michael. 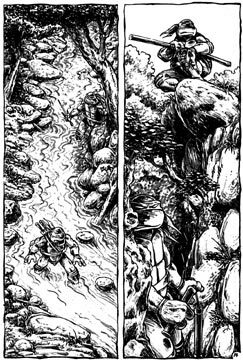 As his men congratulate him on a fine shot, Skonk decides that they'll have to kill everyone - including the people in Turtle costumes and their dog. Casey and April take Michael to their car to get him to the hospital while the Turtles cover their backs. Don and Mike take out two of the extremists while Splinter faces off with Skonk. The Sensei fares well against his much larger opponent, but the madman escapes by throwing debris in Master Splinter's face. Skonk bolts for C.R.A.P. 's bunker. 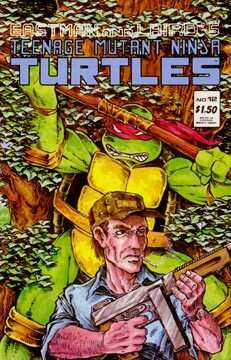 Meanwhile, Donatello has already reached the survivalist's base. Don cautiously maneuvers the camp and escapes a booby trapped door by planning ahead. Donny finds the bomb in the basement of the building. C.R.A.P. 's leader has made it back to his base and grabbed a radio control detonation device. He climbs to the roof of the bunker and awaits his adversaries. 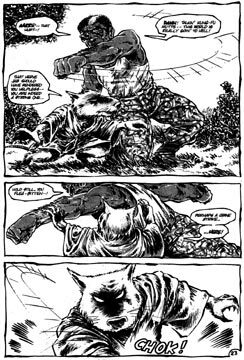 Master Splinter tries to talk sense to the survivalist, but the man is determined to set the bomb off. Just as Skonk is about to push the button, Don arrives on the scene and yells for his family to take cover. Skonk sets off the bomb and the bunker explodes! Later our heroes are sitting on a porch discussing the events. We learn that Michael Murphy is in the hospital and doing well, but the other survivalists escaped. 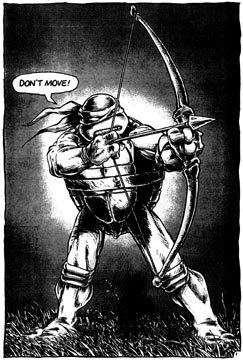 Master Splinter believes that Skonk was the heart of the movement and thus the others will not provide any threat. The Sensei also congratulates Don for his quick thinking - by removing the plutonium core of the bomb, Don was able to make the destruction it caused relatively harmless. April asks Don why he appears to be sad, and Don states that he regrets that someone died and that he does feel some sympathy for the group's basic aim, "After all, in this world plagued by terrorism and poised on the brink of nuclear armageddon... who doesn't want to survive?" On the prowl. Splinter VS. Skonk.